On Fox News Sunday, surging 2016 Republican presidential candidate Carly Fiorina stated that Republicans should shut down the federal government, if necessary, to cut off funding for Planned Parenthood. “I find it fascinating that Democrats will never support taxpayer funding, for example, for a women’s health center right next door to a Planned Parenthood that would provide all those same services and also provide women an alternative to abortion,” she said. In light of recent and horrific revelations that Planned Parenthood is trafficking in fetal tissue and body parts from abortions, we urge you not to schedule or facilitate the consideration of any legislation that authorizes or appropriates federal dollars for Planned Parenthood. But both the Republican House and Senate have decided to engage in failure theater with regard to Planned Parenthood defunding. On Friday, House Republicans voted to freeze federal funding for Planned Parenthood for one year, pending an investigation into the organization. That means nothing because truly removing federal funding and avoiding lawsuits require both defunding Title X funding, as well as changing Medicare reimbursement law. Republicans won’t actually do any of that because Senate Republicans don’t have the vote to reach cloture on either issue, and Senate Majority Leader Mitch McConnell (R-KY) has ruled out any government shutdown. The leadership of both parties, both the Democrats and Republicans, want an empty show vote. They want a vote on Planned Parenthood that has no teeth or no consequence, which allows Republicans to vote for defunding, Democrats to vote for continuing funding, and nothing to change. But the leadership of both parties have publicly said they do not want the vote tied to any legislation that must pass. Given the challenges and threats we face at home and abroad, I oppose risking a government shutdown, particularly when it appears there is no chance of achieving a successful result. Nevertheless, as I understand it, you have been circulating a letter to our colleagues asking them to oppose any government funding bill that continues to authorize funding for Planned Parenthood. … How do we get 60 votes? And if for some reason there were 60 votes, how do we get 67 votes in the Senate to overcome a Presidential veto?” Ayotte asked in her letter. “During the last government shutdown, I repeatedly asked you what your strategy for success was when we did not have the votes to achieve the goal of defunding Obamacare, but I did not receive an answer. Ayotte, Cornyn, Graham, McConnell, and Boehner are right that Republicans will never receive 67 Senate votes to overcome a presidential veto. But they are wrong that a government shutdown would somehow cripple the Republican Party, or that President Obama would allow the government to remain shut down indefinitely over Planned Parenthood. 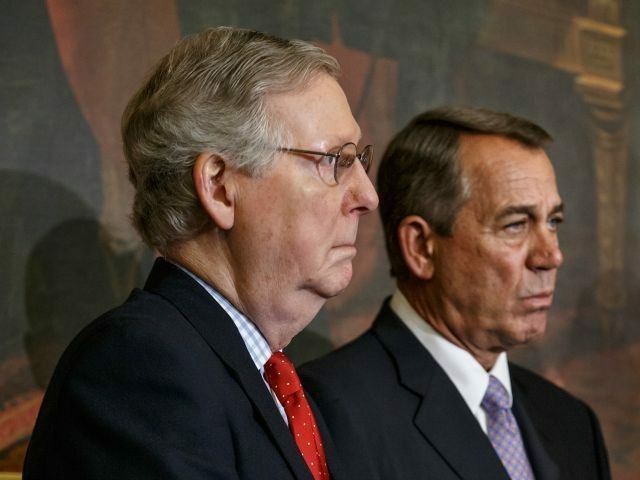 Republicans will not pay a heavy political price for a government shutdown. The evidence simply isn’t there. Republican politicians have spent so long living in an environment controlled by the leftist media that they believe every narrative will be turned to their disadvantage. This is why Republican leadership buys into the idiotic notion that if Republicans fund the entire federal government except Planned Parenthood, and Obama then refuses to sign the budget, they will be blamed for the shutdown. That is not fully true. They will be blamed, but the blame will be split. The narrative in 2013 during the Obamacare shutdown quickly turned from Republican intransigence to President Obama’s peevish attempts to shut down open air war memorials. Republicans looked bad in polls, but so did Democrats. According to a Washington Post-ABC News poll taken right after the shutdown, 53 percent of Americans blamed Republicans for the shutdown, and just 29 percent blamed President Obama – but during and after the shutdown, Obama’s approval ratings dropped from 45 percent to a low of 40 percent. In the end, the shutdown didn’t damage Republicans at all: Republicans won a landslide congressional victory in 2014. If President Obama cares at all about his successor (dubious), he could be pressured to end a shutdown before blowback hit other Democrats. That’s typically the pattern. In 1995, the government shut down when Newt Gingrich refused permission to President Clinton to pursue excessive spending. Gingrich felt the brunt of the blame, but Clinton got hit too, with his approval ratings dropping nearly double digits during the shutdown. Then-Senate Majority Leader Bob Dole (R-KS) stopped the shutdown because he wanted to run for president. The result: Dole, the great hero who stopped the shutdown, got clocked in 1996, but Republicans maintained their congressional majority in that same election, and President Clinton quickly moved to the center to govern as a moderate Democrat in his second term. There’s a reason that Democrats should fear government shutdowns more than Republicans: Democrats like government, and Republicans don’t (or at least purportedly don’t). Democrats should fear government shutdowns because Democratic voters like government and are dependent on it in higher proportion. Democrat supporters may hate Republicans more during a government shutdown, but they already hate Republicans; the only difference is that now they hate their own party, too. Every time Republicans argue that government shutdowns end the world, they campaign as Democrats. Last time the government shut down, America somehow avoided the zombie apocalypse. Republicans should have trumpeted that fact from the highest turret: the federal government operating at 80 percent capacity did not hurt you. Might it not be worthwhile to slash the budget in accordance with that basic fact? Some Republicans fear a government shutdown because of the risks to national security involved. But this is a catchall excuse for never using the only tool outside of impeachment available to stop President Obama from enacting his agenda. Obama could threaten to shut down the government over virtually anything, and Republicans would quickly comply. Besides, during government shutdowns, all employees and offices providing “for the national security, including the conduct of foreign relations essential to the national security or the safety of life and property” continue operating apace; so do employees involved in “essential activities to the extent that they protect life and property.” Benefits programs like Social Security pay out. The postal service operates, as does the Federal Reserve. What, exactly, do Republicans fear? The answer: they fear being held accountable by their own voters. They fear that if they set a precedent of willingness to shut down government, they will be expected to do so by their constituents to hold President Obama’s feet to the fire. They’re not scared of the media or Obama. They’re scared that the failure theater, which requires the fuel of Republican constituent dollars and votes, might come to an end if voters expect them to do something.